When the mercury is rising and the sun is high in the sky, there's only one thing that can make the heat bearable - a delicious, refreshing iced coffee. But when you head to your local coffee house for one of these drinks every day, the cost can really add up. Thankfully, you can make your own at home with minimal effort! Gourmet iced coffee drinks are fun to make and they taste great! This summer, skip the coffee house and make your home the go-to place for amazing iced coffee. The fancier your drink is, the more expensive it will be at the coffee house. But when you make it at home, you can drink as many as you want! 1. With your Mr. Coffee® Pump Espresso Maker, brew two shots of espresso. 2. In a tall glass, drizzle caramel syrup down the inside of the glass. 3. Add the vanilla to the bottom of the glass, then pour the milk on top. 5. Pour the espresso shots over the ice, then drizzle on a bit more caramel and enjoy! Making your own coffee syrup at home means you can choose the quality of ingredients that go into it. The next time you need a sweet drink, try out this recipe with your own homemade syrup. 1. Make the syrup by combining the syrup ingredients in a small saucepan and boiling them for about five minutes, or until the mixture reaches a thick consistency. Allow it to cool. 2. Brew two shots of espresso. 3. Add the cooled syrup to the bottom of a tall glass. 5. Pour the milk and espresso over the ice and stir. 6. Top with whipped cream and cinnamon powder, if desired. This recipe is ideal for those days when you just want something cool and chocolaty. 1. Use a coffee maker such as the Mr. Coffee® Optimal Brew™ 10-Cup Programmable Coffee Maker to brew the coffee. You can use any blend you'd like! 2. Pour the coffee, milk, chocolate sauce and brown sugar into a blender. Pulse until the mixture is frothy. 3. Fill a tall glass with ice and pour the coffee mixture on top. Garnish with whipped cream if desired, and enjoy! Why spend time and money at a coffee house when you can enjoy the beautiful weather at home? 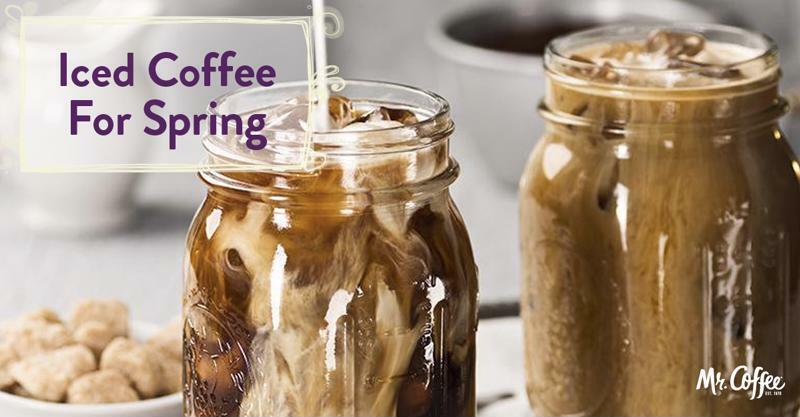 Brew a bold, delicious iced coffee drink at home with your Mr. Coffee® coffee maker.